Students who participated in an intensive childhood education programme from preschool to third grade were more likely to achieve an academic degree beyond high school, compared to a similar group that received other intervention services as children, according to a study funded by the National Institutes of Health. Researchers led by Arthur Reynolds, Ph.D., at the University of Minnesota, Minneapolis, followed the 30-year progress of 989 children who attended the Child-Parent Centers (CPC) programme in inner-city Chicago as preschoolers. Their findings appear in JAMA Pediatrics. “This study suggests that a high-quality, early childhood intervention programme, especially one that extends through third grade, can have benefits well into adult life,” said James A. Griffin, Ph.D., deputy chief of the Child Development Branch at the Eunice Kennedy Shriver National Institute of Child Health and Human Development (NICHD). The CPC programme provides intensive instruction in reading and math, combined with frequent educational field trips, from pre-kindergarten through third grade. The programme also provides parents with job and parenting skills training, educational classes and social services. In addition, the programme encouraged parents to volunteer in classrooms, assist with field trips and participate in parenting support groups. Researchers compared the educational outcomes of graduates from 20 CPC schools to those of 550 children from low-income families who attended 5 other early randomly selected schools in the Chicago area with childhood intervention programmes. The researchers collected information on the children from administrative records, schools and families, from birth through 35 years of age. 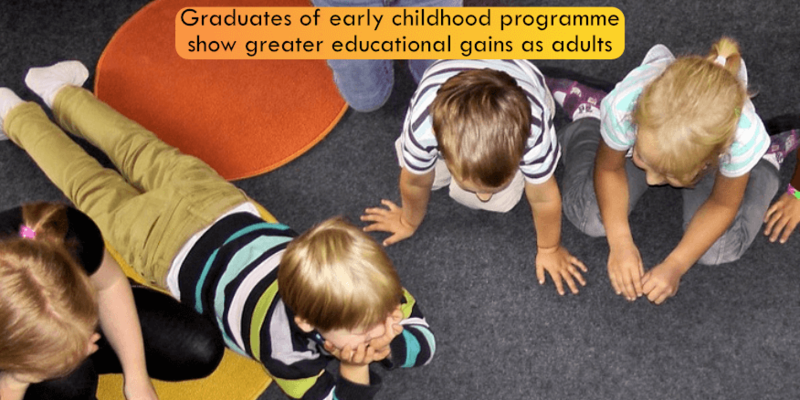 On average, graduates of the CPC programme–whether they took part in preschool only or attended until second or third grade–completed more years of education than those who participated in other early intervention programmes. Among those receiving an intervention in preschool, children in the CPC group were more likely as adults to achieve an associate’s degree or higher (15.7 percent vs. 10.7 percent), including a bachelor’s degree (11 percent vs. 7.8 percent) and master’s degree (4.2 percent vs. 1.5 percent). CPC graduates who attended the programme through second or third grade had even higher educational gains than their counterparts: associate’s degree or higher (18.5 percent vs. 12.5 percent), including a bachelor’s degree (14.3 percent vs. 8.2 percent) and master’s degree (5.9 percent vs. 2.3 percent). The authors wrote that, to their knowledge, their study is the first to follow participants past age 25, a time in life when many people attain advanced degrees. Their previous research has shown that CPC graduates have gone on to have higher incomes, lower rates of serious crime and incarceration and lower rates of depression, compared to those who participated in other early interventions. The authors added that successful early childhood programmes can also improve adult health. They noted that adults with less education are more likely to adopt unhealthy habits like smoking and to experience high blood pressure, obesity and mental health problems.